(Francisco Kjolseth | The Salt Lake Tribune) Macey Roberts performs her floor routine as Utah hosts Penn State in their season opener at the Huntsman Center in Salt Lake City on Saturday, Jan. 5, 2019. Most of the time in collegiate gymnastics, it is those who go late in the lineup, the closers, who capture most of the attention. 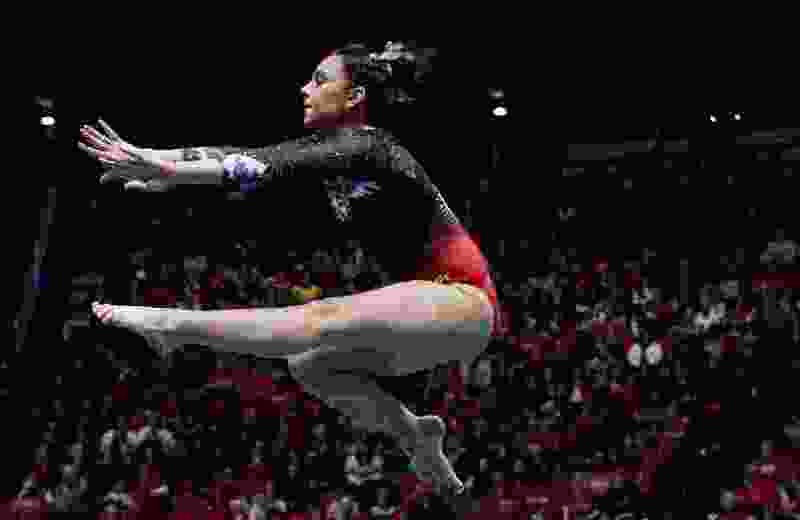 But with her fan-friendly floor routine and easy-going demeanor, Utah senior Macey Roberts is earning more and more attention for her floor efforts. Out of six routines this year, Roberts has scored 9.875 four times and earned 9.85 and 9.825 for the other routines. Those would be decent scores for any point in the lineup, but they are particularly good in the leadoff spot. Roberts is especially happy with her season because the 2017 season didn’t go as planned. After contributing on both the floor and vault her sophomore year, Roberts competed only seven times in 2017 due to a nagging hip injury. Offseason surgery took care of the issue and Roberts has been able to train more this year. Roberts is also doing well on the vault where she is ranked No. 20 nationally with a 9.863 average. That contribution is big because the Utes don’t have a lot of depth capable of pulling in consistent big scores, but it is really the floor where she is most noticed by observers. Roberts is using elements of her routine last year, tweaking the things she didn’t connect with and adding in some new elements. The result is a fun routine that highlights what she says are her limited dance skills. “It’s easier for me to put on a show when I’m comfortable with the dance,” she said. Roberts held the leadoff spot two years ago as well, so she is not only accustomed to the pressure that comes with the role, but enjoys it. The Utes thought of using Kari Lee as the leadoff on floor, but after Macey did so well, they stuck with her. She is glad they did. Of note • Hit 6-of-7 routines as a junior…As a sophomore tied her career high of 9.9 with a floor routine at the Pac-12 Championships…Hit 23-of-23 routines as a sophomore…Transferred from Maryland after 2016 season…At Maryland she had a 9.9 on the floor and 9.825 on the vault for season highs.